To the Honorable President of the General Assembly, Your Excellencies, Secretary General. We all grew up with stories, anecdotes and parables. Stories that give us hope, build our character and spark our determination to change the world. We are told these stories at home, in schools, in places of worship. Thus, we come out of adolescence and enter adulthood with such idealism that we know in our heart that we can change the world. That we are here to unite and not to divide, that we are here to heal, and not to hurt. This is the same Spirit of Idealism we feel the first time we enter the United Nations. Unfortunately, as time goes by, many if not most of us are changed by this world. We become victims of pragmatism rather than champions of idealism. And as things get complicated, and struggles get more difficult, we are tempted to simply “do what is already being done” and accept that we cannot solve the problem. When this happens, we settle for a statement from the majority rather than a broad consensus on how to actually solve the problem. This reminds us that Persistence is good, but it doesn't mean that we should be repetitive and simply keep doing the same thing. Albert Einstein defined stupidity as "doing the same thing over and over again and expecting different results." While certainly there is no stupidity in the United Nations, yet a tendency to just keep doing the same thing seems to plague us all. Trying new things is a challenge, it might, it might not work, but we shouldn't be afraid of trying, nor should we be afraid of failing. What we should fear is stagnating. That we as a community of nations end up accepting failure and making ourselves feel better by “doing something”, even if this “doing something” is the same thing that precisely failed to address the issues and solve the problems. The good news is that there is Persistence in Hope, there is persistence in what we call Hope, and in Idealism and in the aspiration of wanting to change the world. We teach our children “To Love GOD and To Love our Neighbor”. But do we really practice what we preach? So much inhumanity around the world has been done in the name of God, and so little at times are being done for our neighbors. We live in a world that is fast becoming bigger, but also constantly getting smaller. From Families to Clans, to Tribes to a federation of tribes which we call a Nation, now we are but one Global Village. And with tools like the Internet and social media, everything is known and communicated in real time. Thus, nowadays we are all neighbors, all members of the same global community. We rise up together, we suffer together. Being connected to each other all the time has transformed the world into a global community and we are all citizens of this world. Today, our social contract is no longer confined to our nation state. 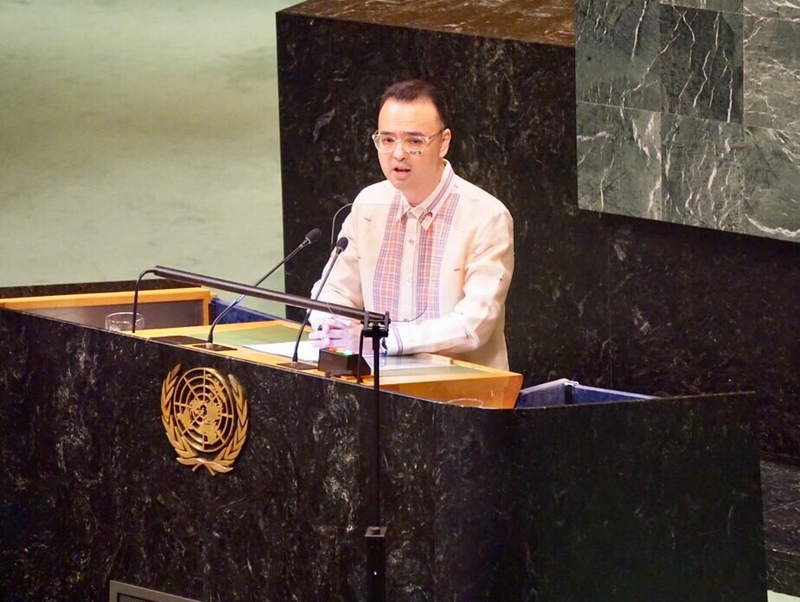 We should therefore exert efforts to connect, to emphasize commonalities and not differences, to think that we are less Filipinos, Americans, Chinese, French, Russians, and to think more of ourselves as global citizens, the people of the United Nations. Yes, it is true that we need not always act with a united front or we don’t always have to act as a community. But neither can we ignore the fact that there are many problems which can only be solved by a united global community. Whether it is issues on protecting the environment, extreme weather conditions, poverty and inequality, Rule of Law, countering terrorism and violent extremism: these are just a few of the problems or challenges that we can only solve together. Together we can find pragmatic idealism, that will give us hope, and momentum to do more. Love thy neighbor! Migration is a reality, it is a fact, it is something that will continue to exist and even to grow. Issues on migration cannot be swept under the rug, but should be discussed openly, frankly and thoroughly. The Global Compact on Migration is a huge step in the right direction. And this huge step will be even a bigger one if we can get everyone on board. Again, Love thy neighbor. Seems like a simple command, and yet in a complex world is sometimes hard to do or implement. That is why the Filipinos thank Pope Francis, we thank the UN Secretary General Guterres and all the countries who led and stood by the GCM. Thank you, migrants around the world for inspiring us to have the first, inter-governmentally negotiated compact to cover holistically and comprehensively all dimensions of international migration. The Philippines under the leadership of President Rodrigo Roa Duterte is one with the United Nations in being uncompromising on the issues of Rule of Law, Just and Equitable Peace that leads to Order, Development and Prosperity, and the protection of each and every human beings’ rights. As a sovereign and democratic country led by a duly-elected President, we are on track in salvaging our deteriorating country from becoming a Narco-State or a State held hostage by the rich and powerful who ignore the plight of the poor, powerless and marginalized, or worse, both. The hunger for change, for peace, for law and order is genuine. There is passion to improve our economy, so that the more than 10 million Filipinos abroad may choose to work at home or abroad, and not be forced by poverty or lack of quality jobs, to go abroad to find high paying jobs at the expense of leaving the country and separating Families. And those at home may at the very least live a safe and comfortable life. We may somehow and sometimes differ in how we express ourselves, yet this should not be interpreted as turning our backs on the universal declaration on human rights. On the contrary, the Philippines and President Duterte are instituting all these reforms to be able to protect the rights of every single Filipino and every single human being living in the Philippines. Yes, the rights of all Filipinos and all human beings, if that is at all possible. But in case, where we have to choose between protecting the rights of a law-abiding citizen and the law enforcer versus the Drug Lord or Criminal, who seeks to kill and destroy, it is clear that we will protect the former. The law enforcer and the law-abiding citizen. Wouldn’t you do the same? Which country, which leader wouldn’t do the same and protect your citizens and protect your law enforcers? Challenges will always be there, but so will Hope! Hope leads to Faith, and Faith with action produces Miracles. The United Nations is the place, the venue of great opportunity, of putting action to our Faith, of changing the world for the better. This is of course if we can transcend our personal and sometimes national interest, for the interest of the global community, or simply put, for the greater good. Faith without action is dead. Again, I’ll repeat faith without action is dead. And the United Nations is not a place to bury our dead, it is a place to rise up, to resurrect our hopes and to dream of a better world. Making the United Nations Relevant to all is difficult. It is a dream, yet it is a dream worth fighting for. The Filipino People will remain to be persistent in our quest for peace, order, development and prosperity, and the quest for a safe and comfortable life for all those living in the Philippines. We will continue to have faith, but put actions to our faith, and we will continue to love our nation and not only preach, but actually do what we preach. And finally, we would like to close our statement by expressing our sincere and profound gratitude to all the Countries and Peoples who have assisted us, stood with us and lifted us up when we needed it most.